Correlations for jet fuel density and temperature are found by use of tools based on ASTM D 1250-04 and IP 200/04 (API Manual of Petroleum Measurement Standards, Chapter 11- physical properties Data, Section 1:Temperature and pressure volume correction factors for generalised crude oils, refined products and lubricating oils). Each colored line represents a jet fuel with a given density at a given temperature. If the temperature changes, the density of the jet fuel changes along the colored line. 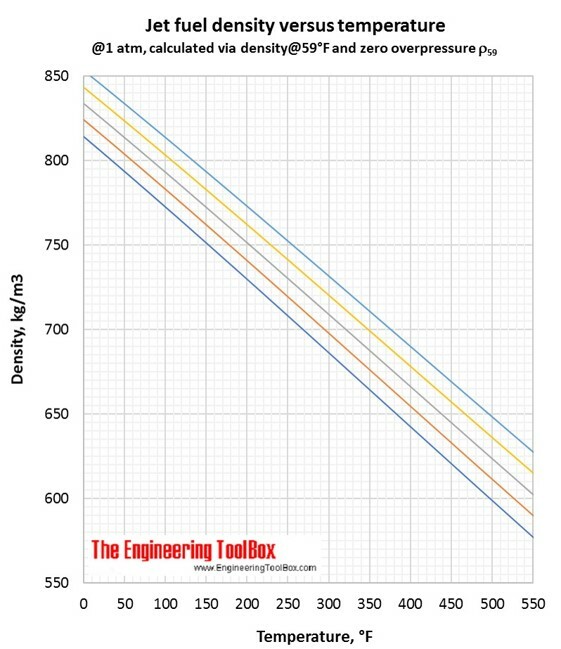 If you have the jet fuel density given in °API, use the API-to-gravity converter. See also similar correlations for fuel oil, crude oil and lubricating oil. Volume correction factors can be used to calculate the volume of a jet fuel at base temperature (15°C/59°F) if you know the density and volume at another temperature. Or, if you know the base volume and density, you can use the volume correction factor to calculate the volume at another temperature. 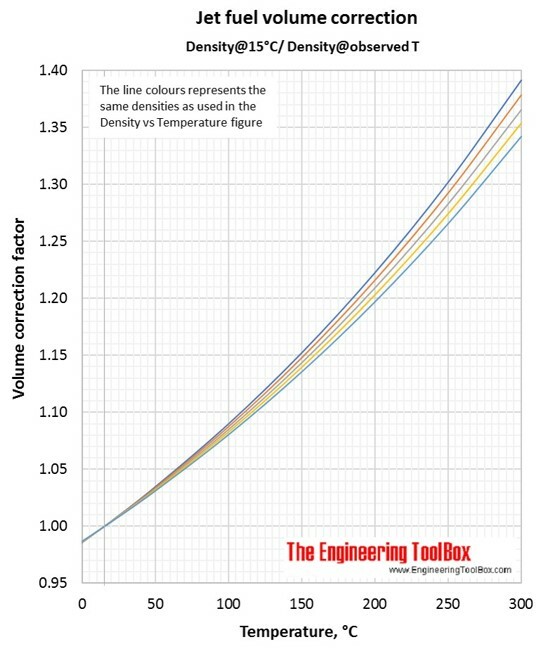 To be sure you have used the correct figure for correction factors, the easy rule is that the volume increases with increasing temperature. You have 100 liters of a jet fuel with a density of 757 kg/m3 at 100°C. What is the volume at 15°C? 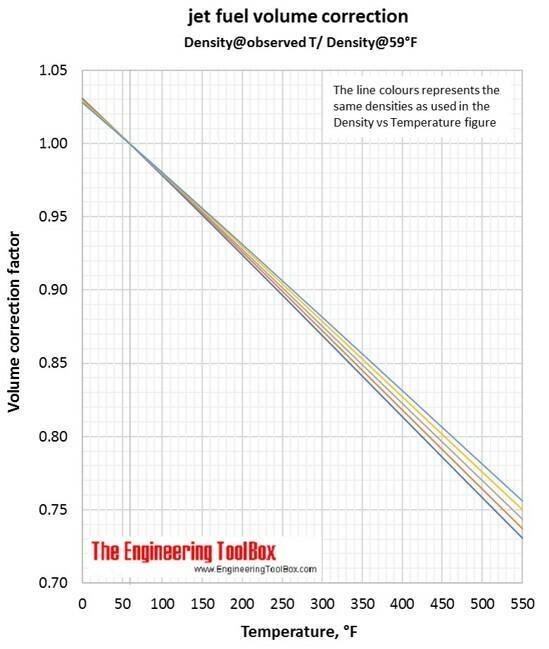 In the Density vs temperature figure(°C), you se that the yellow line represent this jet fuel. Then, use the yellow line in the Jet fuel volume correction figure (Density@Observed T/Density@15°C). At 50°C the correction factor is 0.923. You have 1000 m3 of a jet fuel with a density of 800 kg/m3 at 15°C. How will the volume change if you heat it to 250°C? In the Density vs temperature figure (°C), you see that the orange line represent this jet fuel. 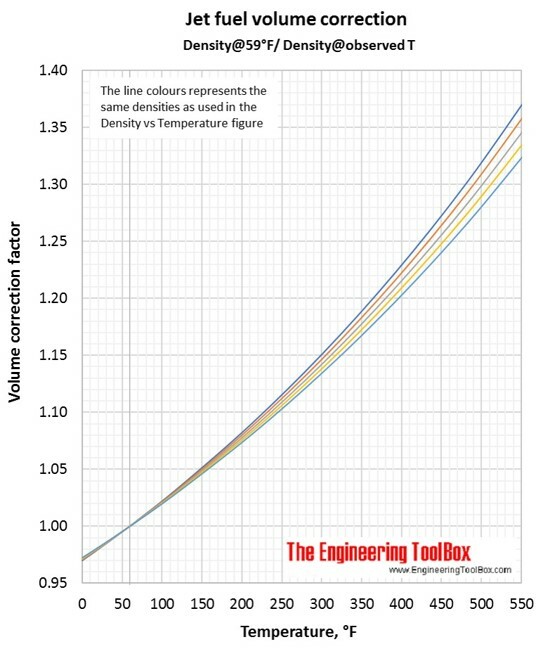 Then, use the orange line in the Jet fuel volume correction figure (Density@15°C/Density@observed T). At 250°C the correction factor is 1.292. Engineering ToolBox, (2017). Density of jet fuel as function of temperature. 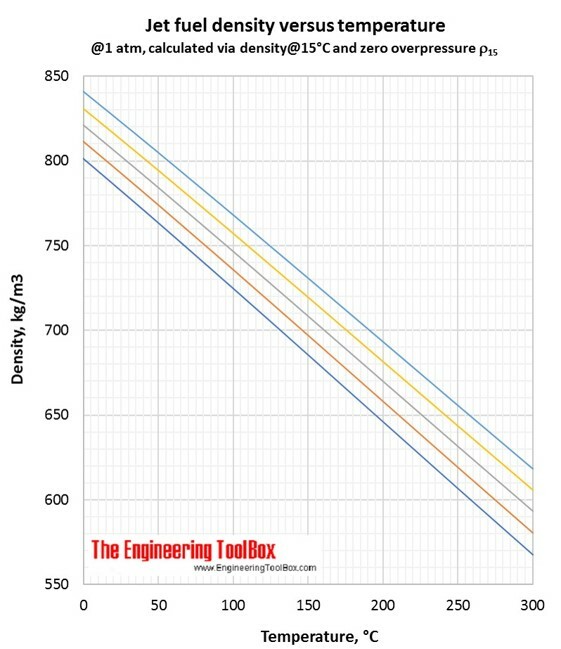 [online] Available at: https://www.engineeringtoolbox.com/jet-fuel-temperature-density-petroleum-volume-correction-ASTM-D1250-gravity-d_1944.html [Accessed Day Mo. Year].